Simple and easy to complete- should take around 7 minutes in total. The compiled report provides a valuable insight into a person’s character from a sales perspective. Very useful when used as an aid to interviewing. Information is provided on the subject’s likely management and sales style. The results even offer a suggestion as to which type of sales role the candidate would be most suitable for. The data is compared against the thousands of people who have completed the test in the past, and ran through a set of validation criteria. This data is then presented in a report which you will receive. It firstly provides a general overview of the candidate’s primary characteristics including their sales style and their preferred method of doing business. The compiled document also suggests the key motivators for the person, and how they would likely behave in a management position. The report even suggests some effective interview questions specifically tailored to the candidate, and finally offers a detailed summary of the person’s traits when working in a sales role. An SPA is a quick and effective tool best used before an interview to gauge and provide further insight on a candidate. 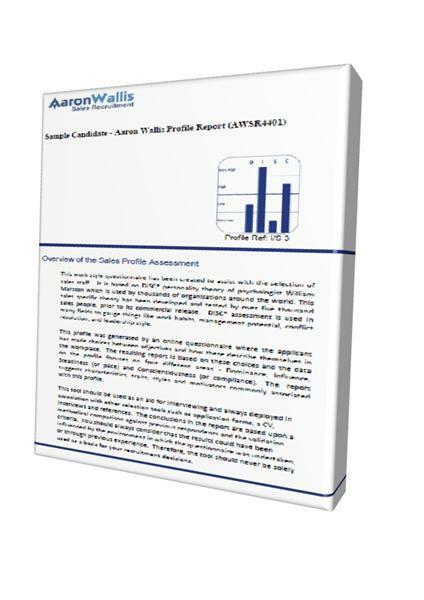 Your Aaron Wallis consultant will give you more information on how best to use the tool in the recruitment process. A sample SPA report can be found here.